The title of Metcalf’s Paradise Haunts ... is drawn from a line quoted in a book about film-maker Derek Jarman: “Paradise haunts gardens and it haunts mine”. The composer came across this when reading a review at about the time Thomas Bowes - the soloist here - asked Metcalf for a new piece. The composer also mentions that he started work on the piece at a time when he felt the urge to simplify his musical language. Paradise Haunts... was “the first work to embrace a wholly pan-diatonic or ‘white note’ style”. This substantial work, a rhapsody in the form of a theme and variations, was originally written for violin and piano. Incidentally, the original chamber version has been recorded and is still available on Lorelt LNT111. The orchestral version was made some time later, in 1998. Variations unfold almost effortlessly and seamlessly, with enough contrast and variety to sustain the work’s long time-span. It concludes with a beautiful coda in which the music eventually dissolves into thin air. 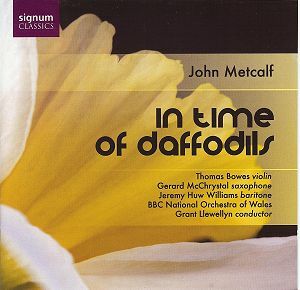 The music, as in the other works of Metcalf, is often warmly melodic and lyrical as well as strongly expressive. In the case of this particular work, I was often reminded of Barber’s Violin Concerto, which does not imply imitation but rather hints at the general tone of the music. A fine, accessible work, albeit steeped in tradition - by 20th century standards - although the solo part must be rather demanding both in technique and in musicality. Similarly, Three Mobiles started out for saxophone and piano. The orchestral version, actually for string orchestra, was made in 2003 when the work was revised. A further revision was made in 2006. The title refers to sculptures known as mobiles - Calder’s celebrated mobiles are an example. In the insert notes, the composer goes into some detail as to how he tried to relate his musical mobiles with those of Calder. The most important thing, however, is the music, although I suppose that close analysis of the score might prove revealing. Suffice to say that in substance Three Mobiles is a concertino for saxophone and strings. It consists of two short, lively outer movements framing a rather more developed, predominantly song-like central movement. Again a quite attractive work that should appeal to saxophone players willing to add to their sadly limited repertoire. Part 2 : To Daffodils, Endymion, To an early Daffodil. Most of the poems are fairly well-known, although I must admit that those by Amy Lowell were new to me. All relate to Spring symbolising death and renewal, although the celebrated prologue to Endymion has a more general meaning. Again, Metcalf’s settings are fairly traditional, in the best meaning of the word, and the words come clearly through the warm, at times lush but always subtle scoring. The music is colourful, superbly scored and – again – attractive and accessible without condescension. While listening to this beautiful work, I often thought that this was the large-scale orchestral song-cycle that John Ireland never composed. Frankly, I mean that as a compliment. These performances will not easily be bettered. Everyone sings and plays with conviction and commitment; and the whole is warmly, yet naturally recorded - a real pleasure from first to last.